This 8 days Vietnam trip delivers the essential Vietnamese destinations for budget-conscious travelers or those who have limited amount of time. All of the historical, cultural and natural “must-see” attractions are visited, including an overnight train journey, as the tour makes its way from north to south. The Beauty Of Vietnam – Explore almost the Hanoi’s highlights with Ho Chi Minh Complex, Hoan Kiem Lake, Hanoi Old Quarter, attend a performance of a traditional theater art unique to Vietnam, water puppetry. – Halong Bay, a natural wonder with thousands of islands rising out of the water , creating a unique and beatiful landscape, visit two of the most stunning caves in the Bay: Heavenlu Palace and Wooden Stake. – Hue city is an important culture, economic, education, health, tourism, science and technology center of Vietnam, take a boat ride along the romantic Perfume River, visit world heritage sites. – Walking tour through the narrow streets of the ancient town, visit some Hoi An highlights such as Chua Ong Pagoda, Chinese Assembly Halls, the 200-year old Tam Ky ancestral house, the Japanese Covered Bridge and the colorful local market. – Explore the city’s grand boulevards, the bustling city of Saigon, visit some popular destinations in Ho Chi Minh such as Reunification Palace, the historic Saigon Post Office and the Notre Dame Cathedral, free time at Ben Thanh Market. Welcome to Hanoi! You will be met at the airport for transfer to your hotel in Hanoi. The rest of the day is free. In the evening, join your Tour Guide and fellow travelers for dinner before attending a performance of a traditional theater art unique to Vietnam, Water Puppetry. Overnight at hotel in Hanoi. After breakfast, start exploring Hanoi by visiting the Ho Chi Minh complex, starting at the late-President’s Mausoleum. The excursion continues on to his humble “stilt house” before visiting the French colonial Governor’s Palace and the 11th century One-Pillar Pagoda. Then take a short drive to visit the Temple of Literature, dating from 1070, the first university in Vietnam and older than the English language. Have lunch at a local restaurant. In the afternoon, take a Cyclo ride through the “Guild streets” of Hanoi’s Old Quarter, passing the Opera House and the Saint Joseph Cathedral. Depart Hanoi in the late afternoon for the scenic three-hour drive through the countryside to Ha Long Bay, a natural wonder with thousands of islands rising out of the water, creating a unique and beautiful landscape. On arrival, check-in at the hotel, then free this evening at leisure. Overnight at hotel in Halong. In the morning, board a traditional junk for a leisurely 4-hour cruise through the 3, 000 limestone islands, many punctuated by caves and grottoes. Visit two of the most stunning caves in the Bay: Heavenly Palace and Wooden Stake. A fresh seafood lunch is served onboard. Transfer back to Hanoi in the afternoon. On the way, stop in at Sao Do to visit a craft center for people with disabilities. On arrival in Hanoi, head downtown for some “retail therapy”. Take the overnight train to the imperial city of Hue at 19: 00. Overnight on the train. Early morning arrival in Hue, we will be met at the railway station for transfer to a restaurant for breakfast. After breakfast, visit the Imperial Citadel and Forbidden City, created in the 19th century for the Emperors of the Nguyen Dynasty. Then take a boat ride along the romantic Perfume River. Stop off at the Thien Mu Pagoda on the banks of the river to see the 7-storey Stupa. The pagoda is also home to the old Austin car driven to Saigon by the Venerable Thich Quang Duc in 1963 for his self-immolation. Transfer to the hotel to check-in. After lunch, take a short drive to the outskirts of Hue to visit the mausoleum of Emperor Minh Mang (1791-1841), built between 1841 and 1843. The Emperor’s mausoleum complex consists of 40 constructions (palaces, temples, pavilions etc) designed on a symmetrical axis. End the day with a visit to Dong Ba market in downtown Hue City. Overnight at hotel in Hue. After breakfast, travel down the coast road passing over the spectacular Hai Van pass to Danang, and visit the Cham Museum and local market in Danang city. Then transfer to the ancient trading port town of Hoi An. On the way, visit the Non Nuoc stone mason’s village and Marble Mountain. On arrival in Hoi An, check-in at the hotel. This evening is free at leisure. Overnight at hotel in Hoi An. In the morning, enjoy a half-day walking tour through the narrow streets of the ancient town, visiting the Chua Ong Pagoda, Chinese Assembly Halls, the 200-year old Tam Ky ancestral house, the Japanese Covered Bridge and the colorful local market. In the afternoon, transfer back to Danang for the short flight to Saigon (Ho Chi Minh City). On arrival, you will be met at the airport for transfer to your hotel. Overnight at hotel in Saigon. In the morning, leave Saigon for the Cu Chi tunnels, an incredible underground system covering nearly 250km2 and home to more than 16, 000 communist guerillas and sympathizers during the war. Return to Saigon for lunch. In the afternoon, take a half-day city tour. Explore the city’s grand boulevards, passing famous sites such as Reunification Palace (the former Presidential Palace), the historic Saigon Post Office and the Notre Dame Cathedral. The last stop for the day is Ben Thanh market (time permitting). Overnight at hotel in Saigon. After breakfast, free until transfer to the airport for departure flights. End of trip. • All transfers within the tour by air-conditioned vehicle, including pick-up and drop-off at airports on arrival and departure days (without guide). 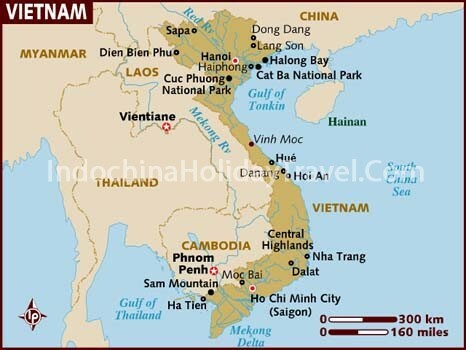 Copyright © 2019 Indochina Holidays Travel |Vietnam -Asia Tours |Southeast Asia Tours.